Is easy and simple to enable the Screen-Saver Password on all Windows Os not only on MS Desktop PCs, this solution is also for all Microsofts Server Systems! 1.) ... Enable The Password for Windows Screen-Saver! 2.) ... What to consider when using the Screen-Saver password! See also: ► Auto login without password! 1.) Enable The Password for Windows Screen-Saver! In the "Personalization" Window (Image-2) select (click) on "Screen Saver" and now activate the option : "On resume, display logon screen"! Conserve energy or maximize performance by adjusting display brightness and other power settings. You can help make your computer more secure by creating a screen saver password, which locks your computer when the screen saver is on. The screen saver password is the same password that you use to log on to Windows. 2.) What to consider when using the Screen-Saver password! Warning, attention! Do not write the screensaver password on, for example, a sheet on the side next to the Windows PC, Anyone can use paper to change the Windows password and have full access to this account, careful storage is therefore advisable. ► How to create a password reset disk for Windows 7? ► How to use the password reset disk in Windows 7? Windows-7 - FAQ-34: How to enable Screen-Saver Password on Windows 7? Image-1 Library Properties on Windows-7 To include or remove folders from librarys in Windows 7 please start the MS-Explorer with keys [Win-Logo]+[E]. Password screensaver windows 7 and find screensaver password? If you want to protect your computer so that it requires a password when resuming? Screen Saver password in windows 7? windows 7 screensaver with password? how do you turn on password screensaver 7? How to turn off screensaver password in windows 7? Windows 7 screensaver password not working? Windows 7 screen saver password? How to turn on win 7 password saver? Can i make my window 7 computer ask for a password after the screen dims? Disable screen lock windows 7? Windows 7 screensaver password protection not working? Free password saver for windows 7? Screensaver with password for windows 7? How do i require log in when screen saver is activated windows 7? Window 7 force all users to use screen saver? Windows 7 does not asking for password after screensaver? Personalization in windows 7 for password? How to turn off windows 7 starter screensaver password? Ho to enable display logon screen windows 7? Disable password after screen saver windows 7? Password Protect screen saver Windows 7? 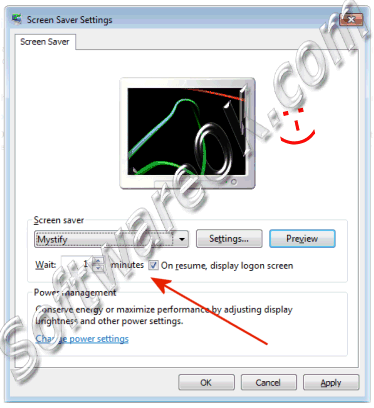 Enable screensaver windows 7, how to password protect windows 7 screen saver? Location where I can add password when resuming from screen saver? I want a Windows 7 screen savers without a password,or I need to buy this extra! I will lock my computer with screen saver password on Windows 7? no password on screensaver win7? no screensaver register windows 7? require a seperate screensaver password in windows? how set password windows 7 in screen saver? screen saver password windows 7? screen saver turn off no admin windows 7? If you want to protect your computer so that it requires a password when resuming from a screen saver in Windows 7 in which of the following locations would you find this feature? screensaver enable to win 7 password? windows 7 screen saver with password? Can I switch off the Win-7 screen savers password? I need the screensaver with password for Windows 7? Can I make my computer more secure on Windows-7? screen saver with password protection in Windows 7 like Win-XP? Can I use my Windows password for my screen saver password? freeware screen saver windows 7 password? windows 7 starter' screensaver password? how to activate windows 7 password?